If you are a successful business person you may be eligible to apply for entry to Australia under Australia's Business Innovation and Investment Program: Australia has always been looking for people who have been successful in business, as business owners, as senior executives or as investors. 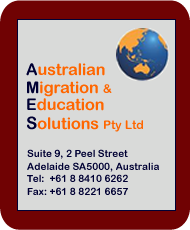 In July 2010 the Australian Government tightened the eligibility requirements for business visas in an effort to increase the potential contribution of business migrants to the economy and to create more jobs for Australians. Specifically, the value level of the assets business migrants were required to bring to Australia were raised and the percentage of controlling interest for business ownership was increased too, especially in the case of businesses with a turnover of less than AUD400,000, where the holding must be at least 51%. key visa criteria were changed to improve the integrity of the program. Many of the details of the new Business Innovation and Investment Program are still unclear: we will expand this section of our website as soon as more detailed and concrete information is available. In the meantime, if you need information immediately or urgently, send us an email or ring us on +61 8 8410 6262.